The boreal owl (Aegolius funereus), also known as Tengmalm's owl belongs to the family Strigidae. The boreal owl species is distributed in Russia, China, Mongolia, India (Lahul, Himachal Pradesh), Kazakhstan, Europe, Canada and USA. These owl species mostly inhabit inaccessible taiga forests. These owls are polytypic species. The boreal owl (Aegolius funereus) is a small true owl. The male measures 20 to 25 cm in length and weighs 90 to 115 grams. The female is slightly larger and measures 25 to 30 cm. in length and weighs 120 to 200 grams. The wingspan is 50 to 60 cm. The overall plumage of these owl species is white and grayish brown. The forehead is whitish and the crown is grayish brown with white spotting. The facial disc is gray and white with blackish brown border. The upperparts of the boreal owl are brown with white specks on the shoulder. The underparts are whitish with brown vertical streaking. The undertail coverts are white. The short grayish brown tail has white bars. The bill is small and pale yellow or grayish yellow in color. The irises are bright yellow. The legs and feet are pale buff. The call of these owl species is a series of trilling "hu.hu.hu.hu" or "khu.khu.khu" sounds that increase in crescendo. These boreal owls are distributed in east, west and southern Russia, northeast and northwest China, northern Mongolia, India (Lahul, northern Himachal Pradesh), north and northeast Kazakhstan, eastern Kyrgyzstan, Europe, Canada and USA. The boreal owl nominate subspecies A. f. funereus is distributed from northern Scandinavia to Pyrénées in southwest Europe and eastwards up to Ural Mountains. The subspecies A. f. caucasicus is distributed in north Caucasus Mountains. The boreal owl subspecies A. f. magnus is distributed in northeast Siberia. The subspecies A. f. beickianus is distributed in northwest India (Lahul, in north Himachal Pradesh) and northeast and central China. The boreal owl subspecies A. f. pallens is distributed in west Siberia, south Siberia, north Mongolia, northeast China and far east Russia. The owl subspecies A. f. richardsoni is distributed in Canada and USA (central and east Alaska, northwest America and Rocky Mountains). The Important Bird and Biodiversity Areas (IBA) of the boreal owls in Russia are, East slope of the Northern Ural, Zaikovo forest, Korgonskaya, Visimsky zapovednik and vicinity, Poyasovy Kamen' ridge and Zapovednik Denezhkin Kamen. The IBA of the boreal owl species in Spain are, Cadí mountains, San Mauricio-Bohí-Beret, Belagua-Ansó-Hecho, Posets-Maladeta, Alt Pallars and Fresser-Setcases. The IBA in Denmark is Almindingen. The IBA in Kazakhstan is Paradise Valley mountain plateau. 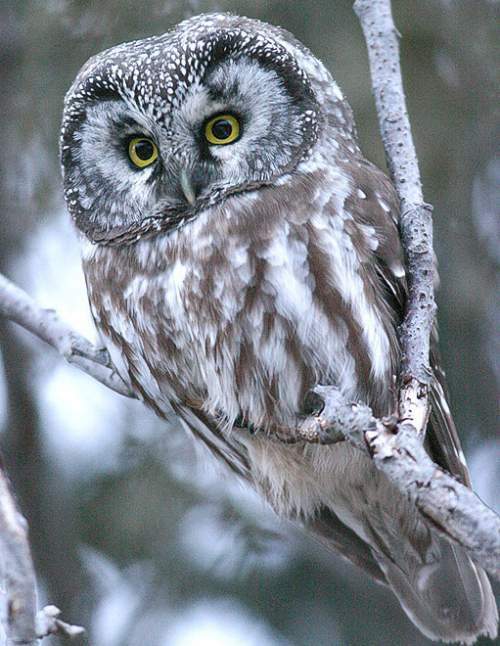 These boreal owl species have high forest dependence. They normally occur in altitudes from 0 to 2500 meters. The natural ecosystems and habitats of these boreal owl species include, boreal and subalpine forests, subarctic forests, temperate forests and montane pine forests. 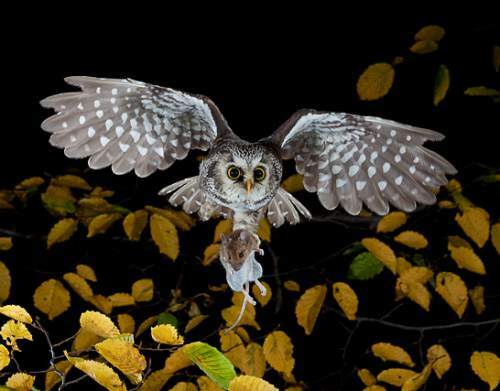 The diet of this boreal owl consists mainly of small vertebrates. Small mammals like, shrews, voles and rats and also birds and insects are their primary food. Though these owls are largely nocturnal hunters, in their northmost range they hunt during daylight, because of the very short nights in Arctic summer. The breeding season of these boreal owl species is from March to July. Though these species are generally monogamous, several cases of polygynous and polyandrous behaviors have been observed when the food supply peaks. The nesting sites of these boreal owl species include dense coniferous forests and temperate montane forests. They nest in natural tree cavities as well as abandoned nest holes of other birds like black woodpecker (Dryocopus martius). The clutch of boreal owl contains three to six white, oval eggs. The female incubates the eggs and the male hunts and feeds the female and the hatchlings. The chicks have dark blackish brown down feathers. These boreal owl species are non-migrant resident birds. They disperse locally after breeding. The populations in higher altitudes descend to the lower levels in winter. They also move southwards within their range during the winter. Post breeding, the juvenile boreal owls may disperse and establish in new locations within the range. Within their range they may make local movements for feeding and breeding. The global population size of the boreal owl (Aegolius funereus) is estimated to number 700,000 to 2,400,000 mature individual birds. The overall population trend of the species is considered to be stable. In most of its range, this owl species is reported to be uncommon to rare. The generation length is 5.8 years. Its distribution size is about 73,800,000 sq.km. Habitat alteration and destruction, deforestation, logging, severe weather, dearth of prey animals, predation by large birds and capture for pet-trade are the main threats that are endangering the survival of these owl species. The boreal owl (Aegolius funereus) does not approach the thresholds for being Vulnerable, either under the range size criterion, or under the population trend criterion or under the population size criterion. The CITES (Convention on International Trade in Endangered Species of Wild Fauna and Flora) status is ‘Not Evaluated’ for the boreal owl (Aegolius funereus). 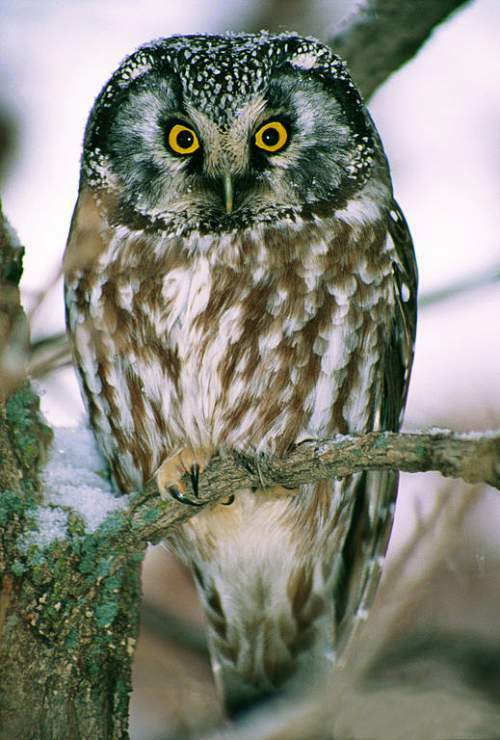 The six recognized subspecies of the boreal owl (Aegolius funereus) are: A. f. funereus (Linnaeus, 1758), A. f. richardsoni (Bonaparte, 1838), A. f. magnus (Buturlin, 1907), A. f. caucasicus (Buturlin, 1907), A. f. beickianus Stresemann, 1928 and A. f. pallens (Schalow, 1908). Current topic in Birds of India: Boreal (Tengmalm's) owl - Aegolius funereus.